We describe a rare case of triamcinolone acetonide entrapment in the Berger's space between the posterior lens capsule and the anterior hyaloid face after intravitreal triamcinolone acetonide (IVTA) injection. The patient underwent neodymium:yttrium-aluminum-garnet (Nd:YAG) laser anterior hyaloidotomy, allowing the trapped fluid to flow into the vitreous cavity. A 65-year-old male with a 15-year history of type 2 diabetes mellitus presented with a complaint of blurred vision in the left eye over a 2-month period. Best corrected visual acuity was 20/30 and 20/80 in the right and left eyes, respectively. Fundus examination showed a bilateral moderate non-proliferative background diabetic retinopathy and a clinically significant macular edema (CSME) in the left eye. Fluorescein angiography revealed diffuse diabetic macular edema in the left eye. Time-domain optical coherence tomography (Stratus OCT3, Carl Zeiss Meditec Inc., Dublin, CA, USA) showed a diffuse thickening in the macula with a foveal thickness of 630 μm. There was no evidence of significant vitreomacular traction. IOP was 16 mmHg in both eyes. Under topical anesthesia, the left eye underwent injection into the vitreous cavity of 0.1 ml (4.0 mg) of a commercially available suspension of triamcinolone acetonide (Trigon Depot; 40 mg/ml, Bristol-Myers Squibb SL, New York, NY, USA) under aseptic conditions in the operating room. The 26-G needle was inserted perpendicular through sclera in the inferotemporal quadrant, 4 mm from the limbus, with the tip aimed toward the center of the globe (to avoid any contact with the posterior lens). As a part of the routine protocol, the patient was instructed not to lie down for 6 hours. The next day, the patient returned to our emergency department complaining of sudden decrease of vision in the left eye. Visual acuity in this eye dropped to hand movements. IOP was unchanged. Slit-lamp examination showed the drug between the posterior capsule of the lens and the displaced anterior hyaloid membrane, within the Berger's space [Figure 1]. There was no view of the fundus, but an ultrasound B scan exam revealed a clear vitreous. During 2 weeks of follow-up, there was no change in the appearance of the milky fluid, and the blurred vision persisted unchanged. With the patient΄s consent, an Nd:YAG laser hyaloidotomy was performed. The anterior face of the hyaloids was nicely outlined by the triamcinolone, allowing easily its identification. It was approximately 1 mm far from the posterior capsule. A Peyman contact lens (OPYG-12/12, Ocular Instruments, Inc., Bellevue, WA, USA) was applied to the eye. After a single pulse application at 2.0 mJ for 1.0 ms duration aiming at the displaced anterior face of the hyaloid, the trapped triamcinolone acetonide leaked into the vitreous cavity. Further pulses were applied to enlarge the opening. The posterior lens capsule was left intact. One week later, slit-lamp examination revealed the complete disappearance of the milky fluid [Figure 2]. IOP remained stable. During the 2-month follow-up, the patient did not receive other treatments, macular thickness decreased significantly to 302 μm, and no posterior subcapsular cataract was observed. Anterior segment problems after IVTA injection are rare and include vitreous prolapse into anterior chamber with or without intraocular lens (IOL) and decentration and opaque coating over the IOL. , Salman et al. reported the only case of entrapment of intravitreal triamcinolone behind the crystalline lens. In that case, the head movement at the time of injection caused the drug to be delivered into the Berger's space between the posterior lens capsule and the anterior hyaloid face. The pathogenesis of this complication is unclear. Probably, the injected triamcinolone was misdirected alongside the anterior vitreous surface. A closed chamber might have formed behind the posterior lens capsule by a central detachment of the anterior hyaloid membrane still adherent to the posterior lens capsule by a fibrosed ring. The lens is usually attached to the anterior vitreous surface along a circular zone called the hyaloideocapsular ligament or ligamentum pectinatum, of approximately 1-2 mm in width and 8-9 mm in diameter. This circular attachment is firm in youth and weakens with age. The potential space of Berger lies within the hyaloideocapsular ligament, where the vitreous is attached to the posterior aspect of the lens. This case highlights the importance of proper technique of intravitreal injections because triamcinolone acetonide may become entrapped behind the crystalline lens if the needle is not properly positioned. 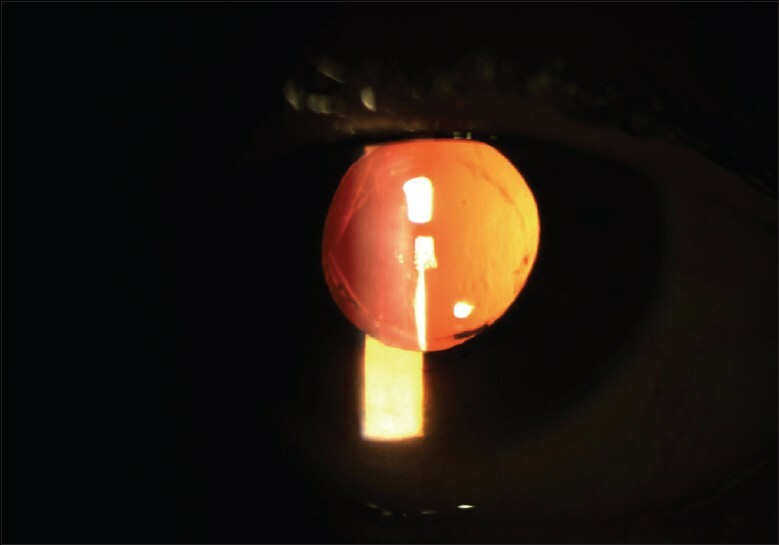 Although both conservative approach to avoid damage to the lens and surgical removal via the pars plana were valid options, we preferred Nd:YAG laser anterior hyaloidotomy. It was successfully performed resulting in a dramatic increase in visual acuity and the lens remaining clear. In conclusion, Nd:YAG laser anterior hyaloidotomy is an effective, simple, useful and minimally invasive outpatient procedure in cases with persistent entrapment of triamcinolone acetonide behind the crystalline lens. This technique offers patient rapid recovery of visual acuity and the avoidance of more invasive surgical procedures, allowing the drug to clear without trauma to the crystalline lens. Nd:YAG laser posterior hyaloidotomy has been indicated for subhyaloid hemorrhages  and premacular vitreous floaters. Likewise, Nd:YAG laser anterior hyaloidotomy has been indicated for malignant glaucoma following cataract surgery. To the best of our knowledge, this is the first case report to document the use of Nd:YAG laser anterior hyaloidotomy for allowing the persistent depot of triamcinolone acetonide to flow into the vitreous cavity. A limitation of this paper is the short follow-up period of only 7 days. Although no complications were observed during this time, late complications such as the progression of diabetic macular edema due to rupture of the anterior hyaloid membrane or the development of a posterior subcapsular cataract might be expected. 1. Cunningham MA, Edelman JL, Kaushal S. Intravitreal steroids for macular edema: The past, the present, and the future. Surv Ophthalmol 2008;53:139-49. 2. Dickerson JE Jr, Dotzel E, Clark AF. 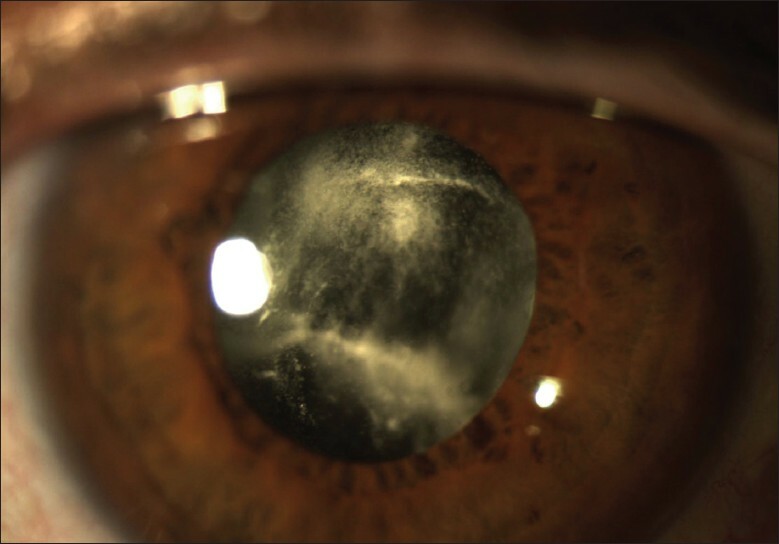 Steroid-induced cataract: New perspective from in vitro and lens culture studies. Exp Eye Res 1997;65:507-16. 3. Gillies MC, Simpson JM, Billson FA, Luo W, Penfold P, Chua W, et al. Safety of an intravitreal injection of triamcinolone: Results from a randomized clinical trial. Arch Ophthalmol 2004;122:336-40. 4. Herschler J. Intractable intraocular hypertension induced by repository triamcinolone acetonide. Am J Ophthalmol 1972;74:501-4. 5. Jonas JB, Degenring RF, Kreissig I, Akkoyun I, Kamppeter BA. Intraocular pressure elevation after intravitreal triamcinolone acetonide injection. Ophthalmology 2005;112:593-8. 6. Wingate RJ, Beaumont PE. Intravitreal triamcinolone and elevated intraocular pressure. Aust N Z J Ophthalmol 1999;27:431-2. 7. Erol N, Topba S. Complications of intravitreal triamcinolone acetonide. Surv Ophthalmol 2009;54:427. 8. Thompson JT. Cataract formation and other complications of intravitreal triamcinolone acetonide for macular edema. Am J Ophthalmol 2006;141:629-37. 9. Moshfeghi DM, Kaiser PK, Scott IU, Sears JE, Benz M, Sinesterra JP, et al. Acute endophthalmitis after intravitreal triamcinolone acetonide injection. Am J Ophthalmol 2003;136:791-6. 10. Jonas JB, Spandau UH, Schlichtenbrede F. Short-term complications of intravitreal injections of triamcinolone and bevacizumab. Eye (Lond) 2008;22:590-1. 11. Meyer CH, Brinkmann CK, Helb HM. Choroidal detachment after an uneventful intravitreal injection. J Ocul Pharmacol Ther 2010;26:305-7. 12. Degenring RF, Sauder G. Vitreous prolapse and IOL dislocation during intravitreal injection of triamcinolone acetonide. Graefes Arch Clin Exp Ophthalmol 2006;244:1043-4. 13. Chen SD, Chen FK, Patel C. Opaque coating of the intraocular lens and regression of iris neovascularization following injection of triamcinolone acetonide into the anterior chamber. Clin Exp Ophthalmol 2006;34:803-5. 14. Salman A, Parmar P, Coimbatore VG, Meenakshisunderam R, Christdas NJ. Entrapment of intravitreal triamcinolone behind the crystalline lens. Indian J Ophthalmol 2009;57:324-5. 15. Spencer WH. Vitreous. In: Spencer WH, editor. Ophthalmic Pathology: An Atlas and Textbook. 4 th ed. vol. 2. Philadelphia: WB Saunders; 1996. p. 623-66. 16. Kirwan RP, Cahill MT. Nd:YAG laser hyaloidotomy for valsalva pre-macular haemorrhage. Ir J Med Sci 2011;180:749-52. 17. Van der Veken A, Van de velde F, Smeets B, Tassignon MJ. Nd:YAG laser posterior hyaloidotomy for the treatment of a premacular vitreous floater. Bull Soc Belge Ophtalmol 1997;265:39-43. 18. Halkias A, Magauran DM, Joyce M. Ciliary block (malignant) glaucoma after cataract extraction with lens implant treated with YAG laser capsulotomy and anterior hyaloidotomy. Br J Ophthalmol 1992;76:569-70.